C.S. 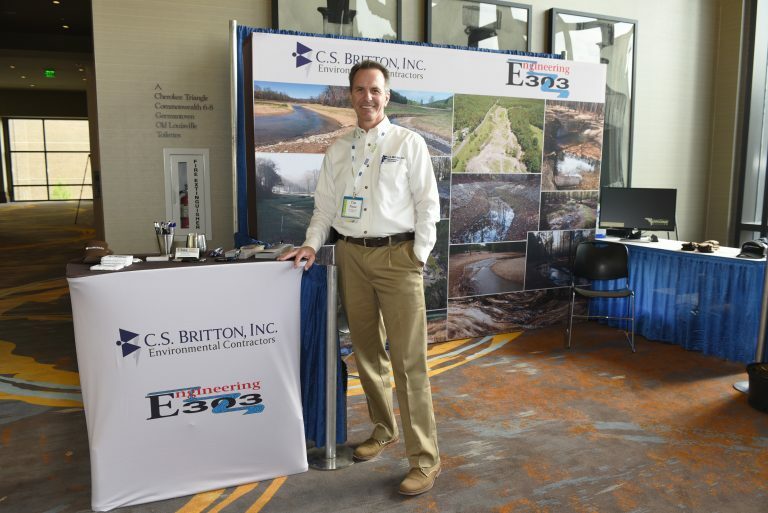 Britton, Inc., a nationally known stream restoration contractor has participated in its first trade show as an exhibitor. The National Mitigation and Ecosystem Banking Conference. This years conference was held in Louisville, KY at the downtown Omni Hotel. It was an exciting milestone for CSBi as we seek to expand our influence and support our growing national customer base. Displaying from May 7th thru the 11th, the show included more than 35 exhibitors. Attendance to this year’s show exceeded previous records as more than 500 environmental professionals from all over the United States were there. The Louisville attendance set an all-time conference record. Brian King of Engineering 303, an industry friend and fellow believer in Natural Channel Design (NCD) stream restoration was also in the booth. His knowledge and experience made him a beneficial and welcome participant. This year as in past years there were a variety of exhibitors in attendance. Banking companies, banking associations, conservation and lobbying groups, engineering firms, growers, software developers as well as insurance companies. In addition to the exhibits there were multiple opportunities to participate in educational sessions. These were led by fellow practitioners or industry regulators covering a multitude of topics. The sessions were an opportunity for asking questions, sharing past experiences or voicing concerns about the industry. There were also opportunities to visit local mitigation banks, for some this was a valuable opportunity to see an established bank as well as some under construction. It did however require being away from the conference for a full afternoon. Lastly CSBi will be exhibiting at the Southwest Stream and Wetland Restoration Conference in San Antonio, TX later this month. The show will run from May 30th thru June 1st. We hope to see you there!